The storming of the Bastille in 1789 was a turning point for France. Today, the anniversary remains the biggest celebration in the French calendar. 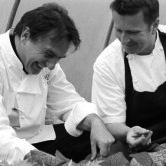 This summer, Raymond Blanc will celebrate the start of the French Revolution in true Gallic style. Anticipate accordion music, refined French cuisine, classic wines and timeless hospitality. It’s an occasion not to be missed. Includes Champagne Laurent-Perrier reception with canapés, four-course lunch with accompanying wines, coffee and petits fours. Tables shared with other guests.